Rhapsody on the Blue: Yet Another Day in Paradise? A beautiful day. The sun is shining and birds are singing. The waves are lapping gently against the boat. I have lots of fun things on the agenda. First up- defrosting the refrigerator. This is one of the lovely chores that boat life provides us. I have memories of my father defrosting the freezer and throwing chunks of ice out on the grass for us to play with. This joy has been removed from most people's lives with the advent of the frost free fridge. On Rhapsody I get to do it every 2-3 weeks, sooner if the air temperature is higher. 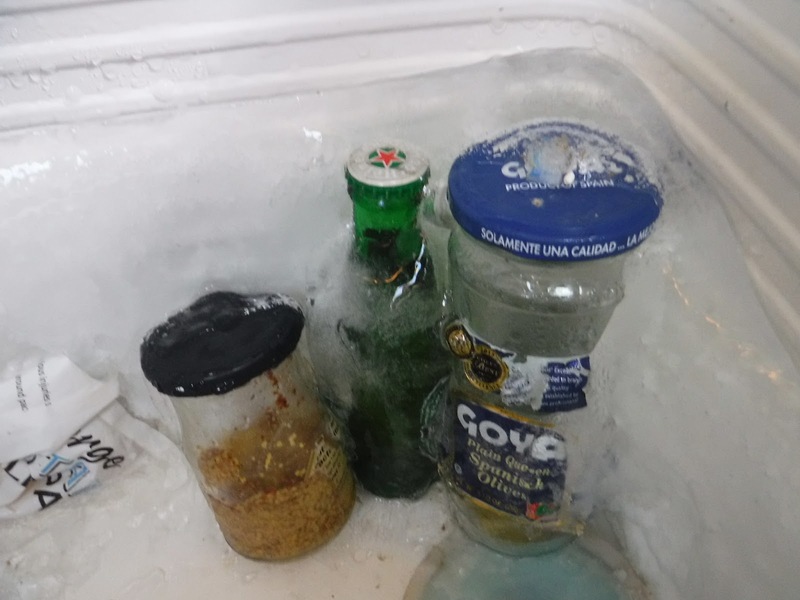 Steps to defrosting a top loading fridge. 1) Unload everything- Best time to defrost the fridge is before a shopping run. 2) Place everything in an insulated cooler bag and wrap it up with a foam mattress for extra insulation. 3) Check to see if there is any hot water. This will depend on how long it has been since we have run the engine. We have a hot water tank that uses the heat from the engine, but we do not have a hot water heater. 4) Use hot water if available, otherwise use tap water to pour over ice on cooling plate. Yes, I know this is a waste of water (a valuable commodity ) and I could simply wait for the ice to melt but a) I am impatient and b) my groceries are getting warmer by the minute. 5) Remove all ice from cooling plate, being careful not to damage the plate or the wire that runs behind it. The ice behind the plate is always the toughest to get out. 6) When all ice is gone, wipe down walls and shelves. 7) Return food to fridge. Did I mention this was a top loading fridge? This means that everything has to fit in like Tetris pieces and the items that are most used need to be left accessible. 8) Stand back and admire work, the order and the lack of ice is but a fleeting thing. The next order of business - going to town for groceries and laundry. "You get the grocery bags, I'll close the hatches"
"I have the key to lock the boat, do you have the dinghy keys?" "Got your hat and sunglasses?" "I'll start the motor, you lock up"
"Did you get our shoes?" And off we go, through the anchorage, following the red and green buoys that mark the channel, take a right into the marina, past the mega yachts and find the dinghy dock. Tie up and lock the dinghy, unload the day packs and our shoes and head to the store. The grocery store in Jolly Harbor, Antigua is large and well stocked, always a joy to find. The prices are listed in Eastern Caribbean Dollars (XCD) which is currently about 2.7 to the dollar. This adds to the anxiety of looking at prices. A box of cereal that we are already gasping at paying $5 US for now reads $13.50 on the shelf. It doesn't cost any more, it is just more difficult psychologically to take it off the shelf. Do we really need it? Will we find it at the next port? Will the price be higher or lower there? After a successful shop (only costing $17,000 ) we are off to pick up the laundry. 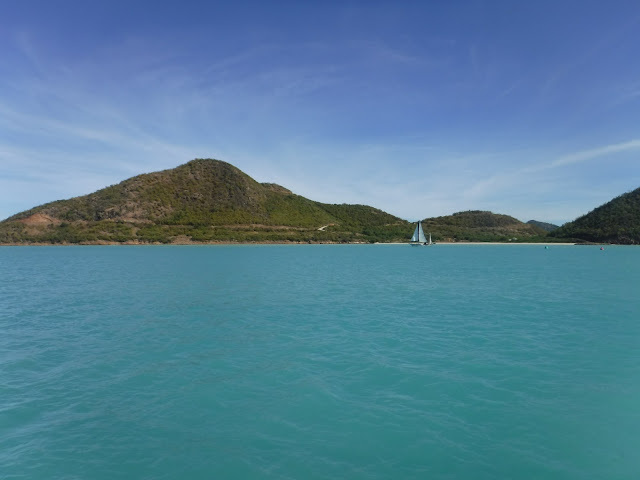 In Antigua, as in most of the previous countries we have been in there are no laundromats, only laundry services. We drop off the load one day and return to retrieve it the next, washed, dried and folded. Yesterday we dropped off the bags and I asked the woman how long it would take and how much she charged. She replied that the laundry would be ready after lunch, and the cost was $ 35 EC per load. ( About $ 13 USD ). Today after grocery shopping and lunch I returned. I was told that she had been having some difficulties with the dryer, could I come back in an hour? Sure, I said. Back to the dinghy dock and back to Rhapsody to unload the groceries into the nicely defrosted refrigerator and wait for the laundry. It was during this wait that I got to perform another lovely boat chore, scrubbing the toilet. Because the toilet is a ) manual (meaning you have to pump the handle up and down to bring in the water and then again to pump it out) and b ) flushed with sea water, there is a buildup of " scale " that doesn't happen in a " normal " toilet. I will spare you the pictures and the detailed explanation. Suffice it to say it took me 45 minutes of hard scrubbing and rinsing and scrubbing but now the toilet is pleasingly clean. Time to get the laundry. 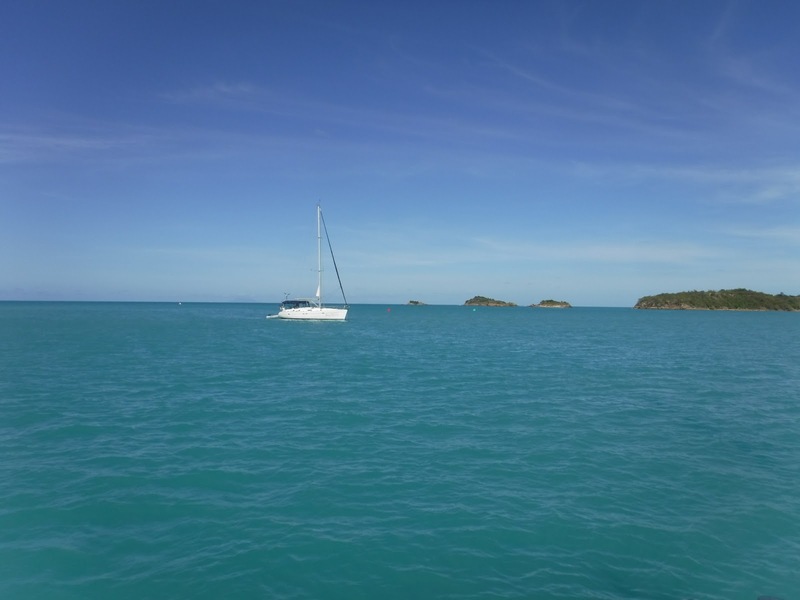 Load up the dinghy, back through the anchorage, following the red and green channel markers to the laundry service. Our laundry is still not done, but at least it is in the dryer now, although as we were standing there , the dryer stopped again. This is not your typical electric dryer. This is a propane dryer. The upper section of the dryer is open, and when it is running there are visible flames shooting out of the door. The flames have subsided and the tumbler has stopped. The woman explained that it has been stopping for about 15 minutes at a time. Come back in an hour and it will be done. Back to the dinghy dock and back to Rhapsody. The next order of business was a call to Citibank. One of our credit cards has been continually declined. The drill goes something like this- I call Citibank and explain our situation. They fix the card and it works for a day and then is declined again. This is call #4. I have explained to them that we are traveling, that we will be in many different countries and that we do not have a return date. The last two calls I even listed all of the countries that we might be going to this year. On phone call #3 I asked how we could avoid this in the future. The very pleasant gentleman said "I will write down all the countries "
"They did that last time" I said. "I will give you a reference number this time" he said. "They did that last time" I said, "how can I avoid this?" "It won't happen again" he said. The card worked for one transaction and was declined the next day. Thank goodness we have two cards. This phone call (#4) I began by asking for a supervisor. She was very pleasant and apologetic and sent me off to to a supervisor in the Fraud Prevention Department. Another helpful person. She said they would put a "suppression" on the fraud warnings on the card. Is this a good thing or a bad thing? I hope this means we can use the card, but it reminds me to be vigilant on the charges appearing on my bill. Time to go get the laundry. Load up the dinghy, back through the anchorage, following the red and green channel markers to the laundry service. The good news, the laundry is done. The bad news, she wants $54 dollars. That's USD, not Eastern Caribbean Dollars. She is charging us for 4 loads of laundry. I think we barely have 4 loads of laundry if we were washing all of our clothes on the boat. Adding insult to injury, most of our clothes are second hand and probably did not cost much more than $54 to purchase them all. I think we need to find another solution in the future. At this point we had no choice but to pay for the laundry, (did I say $54? I meant $17,000 ) load up the dinghy and head back to Rhapsody. Fortunately the last activity for the day was an enjoyable one, a kayak paddle around the bay. The water around Antigua is shallow and the bottom is sandy giving the water an amazing aquamarine turquoise color. The bottom is not clear, the sand churns up a bit so the water is milky looking. The pelicans fly by, then sit and perch on the rocks, watching me watch them. I head off into the wind so that when I am returning, the same winds that I am now fighting will work with me to get me back to Rhapsody. I can see Montserrat and St. Kitts. Guadeloupe is too far around the corner to be visible. A beautiful day, the sun is shining, birds are singing, the waves are lapping gently against my kayak.